We’re all about safety! J&J products undergo ongoing testing to ensure an optimal level of safety and standards set by federal and state highway transportation agencies. All while increasing hydraulic efficiency. "J&J gives good service ... they’re honest and their integrity is the highest. They're very, very reliable ... people you like to do business with and spend the day with. And that doesn’t happen very often. We're long-time customers — 25-30 years — and buy their standard flared end sections. It's a good product, and the staff is very knowledgeable about the products. I've never had a problem." Below are some of the most frequently asked questions about J&J Drainage Products Co.® and services. If you have additional questions, please Contact Us. Do J&J end sections meet safety standards? Our products meet – and sometimes exceed – federal and state transportation agency standards for highway safety. Our products undergo challenging tests for safety and hydraulic efficiency to make sure we’re ahead of the standards. This is only one reason why many engineers and designers call for J&J products by name. Are J&J end sections compatible with all types of pipe? Yes. We have end sections that connect to steel, concrete, HDPE, aluminum and aluminized Type 2 culvert pipe. In fact, J&J offers the widest selection of end sections in a variety of sizes and slopes in North America, including the metrics for the Ministry of Transportation in Canada. End sections are available in what materials? Standard End Sections may be ordered in galvanized steel, aluminized steel (galvanized steel with an aluminum alloy coating) and aluminum. Safety Slope End Sections are available in galvanized and aluminized steel. What type of end section is available for concrete pipe? Both our standard flared end section and safety slope end section are available in a variety of sizes and slopes. The safety slope end section can be ordered with either traversable parallel or cross-drain bars. This end section significantly reduces the hazard to motorists while increasing the hydraulic efficiency of the culvert. J&J Drainage Products Co. was the first in the nation to develop the safety slope end section. What is the lifespan of your end sections? The lifespan depends upon the materials (galvanized and aluminized steel or aluminum) and can vary from region to region. Factors such as the environment and soil around the end section affect its longevity. Easy attachment, however, allows the end section to be reused should the pipe need to be moved, replaced or elongated, greatly increasing its lifespan. How can I be sure your end sections will fit the pipe? J&J products are cut with exacting precision by our custom-designed Trumpf machine that ensures 100 percent computerized consistency within a product line. The Trumpf ensures a smooth, uniform fit time and time again, eliminating even minute variations. 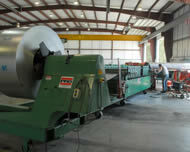 It offers one of the largest platforms of any cutting machine in North America. How are end sections attached to the pipe? A Type 1 strap with bolt and nut, or a Type 2 rod connector with nuts and side lugs are provided with all end sections. Installation is easy and requires only standard wrenches. For concrete and HDPE pipe, a smooth tapered sleeve made of galvanized or aluminized steel is wedged snugly and securely inside the pipe. What options are available in J&J’s safety slope end section? These end sections can be ordered with bars – parallel or cross-drain – in a variety of sizes and slopes. Bars are made from 3-inch pipe. The parallel bars are typically oriented parallel to the main flow of traffic. They are typically used under access ramps, intersecting side roads, media crossovers, driveways and field entrances. Cross-drain structures are used primarily under major roadways and highways and run perpendicular to the main flow of traffic. They also are known as cross-road pipes. J&J offers the widest selection of end section slopes in the world. Standard end section slopes are 1.5:1 to 2.5:1 for both round and arched. Safety slope end sections are available in 4:1, 6:1 and 10:1 slopes. Do safety bars come attached to the safety slope end section? The parallel bars are delivered unattached and can be easily assembled with standard wrenches. The cross-drain end section arrives as a welded grid. Bolt holes are prepunched in the end section walls for easy attachment of bars to the pipe. All pieces are shipped together. What if the culvert calls for multiple pipes? J&J manufactures twin, triple and quad standard end sections in a variety of sizes for round and arched culvert pipe. What other end section products do you carry? Optional products that can be attached to an end section include a toe plate extension that anchors the end section and Indiana toe plate extension. 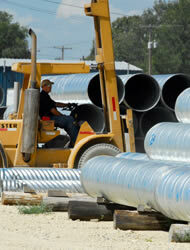 The dimpled adaptor band allows the end section to be attached to nonrecorrugated pipe. What about maintenance of the end section? It’s easy! Mower blades and sickle bars pass harmlessly over the end section because it is installed flush with the slope. During snow removal there are no hidden obstructions to slow the job or damage the culvert or maintenance equipment. What protection do you offer against trash getting into the culvert? Optional J&J trash guards, available in various sizes and styles, can be attached to an end section for effective protection against debris. Read about easy installation (pdf). Do you make window wells, valve boxes, and other such smaller products? Yes, we offer an entire line of corrugated steel products – pipe and special fabrications – for the farm, home, roadway, business and individual. These products are available only in Kansas and are sold direct to customers in our home state. Yes! Speak to one of our representatives to discuss the project. Our responsive staff ensures that orders are promptly filled…and we ship from stock. Raw materials are available on-site. No waiting for shipment from a distant location. Yes! We accept MasterCard, VISA and Discover cards. We’ll ship by the means most feasible and effective for your order and location. In some cases J&J products will be delivered on J&J trucks. Customers in the area also may pick up their order between 8 a.m. and 3 p.m. weekdays at our Hutchinson, Kansas plant. 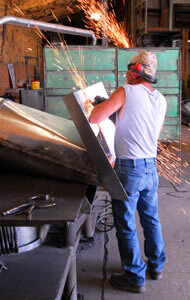 Our offices and manufacturing plant are located at 110 N. Pershing, Hutchinson, Kansas, 67501. Yes, our driver representatives are knowledgeable about our products and installation and can advise you. What about the quality of J&J products? J&J products are made from certified materials meeting or exceeding AASHTO and ASTM standards and Buy American Act criteria. For greater strength we use bolts in place of welding (except on welded cross-drain bars). You’ll find exacting – computerized – consistency due to our Trumpf machine that offers one of the largest platforms of any cutting machine in North America. Our experienced, long-time employees provide superior workmanship, service and support.